Walt Disney purchased the rights to a novel by T. H. White called The Sword in the Stone in 1939 after it was brought to his attention by story man Bill Pete, but he sat on it for a number of years. The book was the first in a popular series called The Once and Future King, which was also adapted as a stage musical in 1960 and live action film in 1967 by Warner Brothers called Camelot. Walt's animators started making drawings for an animated version in 1949, but it wasn't until Walt saw Camelot on Broadway starring Julie Andrews that he decided to resurrect the project. Wolfgang (Woolie) Reitherman was given the film to direct, his first solo directorial debut after codirecting One Hundred and One Dalmatians and a career in Disney animation the predates Snow White and the Seven Dwarfs. Bill Peet adapted the screenplay, having been on the story team for nearly every Disney animated film since Pinocchio. The artistic style of the film is similar to One Hundred and One Dalmatians because of the Xerox process used to transfer the animator's drawings directly to celluloid, eliminating the need for the Ink Department. Walt wasn't a fan of this style, but it was the only way to continue making animated films at a reasonable cost to turn a profit. Sebastian Cabot was cast as the narrator and Sir Ector in his first of several Disney voice roles. Karl Swenson lends his voice to Merlin and returned to the studio in 1970 in the live action film The Wild Country. Three child actors take credit for the voice of Wart/Arthur due to voices changing during the length of production. Rickie Sorensen is the main voice, who was in a Disney TV film called Johnny Shiloh and returned to the studio in 1978 with a small role in The Cat from Outer Space. The other two voices were the director's sons, Richard and Robert Reitherman. Another familiar Disney voice is Junius Matthews who voices Archimedes and went on to voice Rabbit in the Winnie the Pooh shorts and compilation feature. Martha Wentworth who voices Madam Mim had also voiced Nanny in One Hundred and One Dalmatians. The Sherman Brothers were hired to write songs for their first Disney animated feature, although they had been writing songs for live action films for a few years. Five of the songs they wrote are used in the film. The opening credits sequence features an orchestration of songs from the film. Like most Disney fairy tales, a book opens to explain that England's king died without an heir to the throne, but a miraculous sword in a stone appeared with a description that the person who can pull the sword out will be the rightful king. Many tried, but nobody could succeed, leading to the dark ages where the sword had been lost and forgotten. Merlin and his owl Archimedes have been waiting in their wood cottage for a young boy they've never met, who falls through their roof while chasing after his brothers arrow. The boy introduces himself as Arther, aka Wart by his abusive family. Merlin magically packs his things so he can educate him. Sick of not having a king, London decides to have a tournament on New Years Day and the winner will be announced king. Wart's brother is being primed for the tournament while Merlin teaches him some valuable life lessons such as "brains over brawn" by transforming into fish and the power of love by transforming into squirrels, but after transforming him into a bird, he gets chased by a hawk and ends up in the cottage of Madam Mim, a witch and Merlin's worst enemy, who plans to destroy him. Merlin comes to the rescue and the two have a magical wizards duel in which they transform into other things to fight. When Madam Mim breaks the rules by turning into a dragon, Merlin transforms into a virus and makes her sick, winning the duel and teaching Wart that knowledge and wisdom are the real power. On New Years Eve, Merlin is brought to London to be his brother's squire in the duel, which angers Merlin who takes off for Bermuda. When Wart realizes he forgot his brother's sword, he runs off to find one and discovers one stuck in a stone. He pulls it out and returns to the tournament with it, where they cancel the tournament because England now has a king. Merlin returns in tropical shorts, a polo shirt and baseball cap from his vacation to future Bermuda to tell Arthur about the greatness that will come from his being king. The Sword in the Stone was released on December 25th, 1963. Critics went wild over it, praising its modern humor, catchy songs and beautiful imagery. However, it was only a moderate success at the box office, bringing in $4.5 million. That would be great for a live action film, but Disney animated films typically grossed a lot more. It got an Oscar nomination for Best Score. It was rereleased to theaters in 1972 and in 1983, when it was paired with a new short Winnie the Pooh and a Day for Eeyore. made its home video debut in 1986. There are so many great Disney animated films that make The Sword in the Stone feel somewhat forgettable by comparison, but that's not to say that it's not a great film in its own right. The character animation is perfectly done, the designs are appealing and the voice cast does a fine job of breathing life into each character. If the film has any faults, its that the episodic plot makes it easy for the audience to lose interest since its a series of comedic lessons leading up to Arthur becoming king. A lot of the jokes are specific to the 1960's as well, many of which are lost on a modern audience. The true highlight of the film is the duel between Merlin and Madam Mim. Bill Pete has admitted that his adaptation of Merlin is meant to be Walt Disney, borrowing many of his quirky attributes and even some facial features (Merlin has Walt's nose). 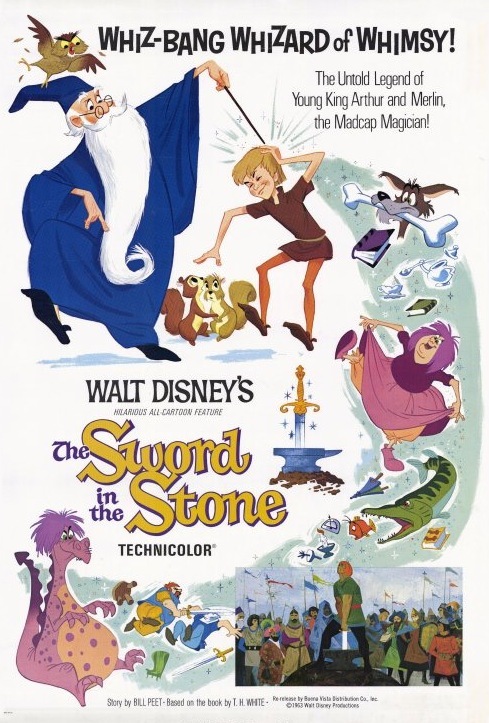 While two more animated features were put in production during Walt's final years, The Sword in the Stone was the last to be released during his lifetime. The film has inspired theme park experiences at Disneyland, Walt Disney World, Disneyland Paris and Hong Kong Disneyland where Merlin finds a child who will be able to pull the sword from the stone. While the ceremonies don't take place any more at the US parks, Merlin still greats guests in Paris and Hong Kong and the sword and anvils can still be found in the parks today for photo opportunities. The final gag in the film in which Merlin returns from his trip to the future is repeated in 1992's Aladdin when Genie appears in a Hawaiian shirt wearing Goofy ears from Disneyland. The Sword in the Stone is currently available on Blu-Ray in a 50th Anniversary Edition, where it is presented in 1.75:1 widescreen. This is the way some theaters would have presented it in 1963, although the exhibitioners guide doesn't specify an aspect ratio and some theaters played it in it's animated full screen ratio. Bonus features include a new alternate opening, featurette on the Sherman Brothers music in the film, an excerpt from an episode of Disneyland called "All About Magic" excerpt, Classic Shorts (A Knight for a Day and Brave Little Tailor), and a sing-along with the movie option. The DVD included and sold sepeerately also has photo galleries and fun facts. For those also interested in owning the fullscreen version of the film, which gains picture on the top and bottom and looses a little on the sides, the previous 2 releases (45th Anniversary Edition and a Gold Collection release). Both fullscreen releases offer a similar restoration, but the Gold Collection release featured the full episode of "All About Magic" and doesn't lose any of the bonus features found on the 50th Anniversary Edition. The film is also available on iTunes in the fullscreen ratio, where it is offered in HD as well and with iTunes extras.